Derek Fisher’s disastrous end to his tenure with the New York Knicks has not turned him off from coaching. Or from the idea that he, not even two years removed from retiring as a player, can coach in big markets. Sources indicate Derek Fisher has interest in the Lakers job. Obviously Laker front office still compiling their list and gauging interest from potential candidates after Byron Scott wasn’t retained Sunday night. This isn’t going to happen. The Lakers, per various reports, have made a list that includes only experienced candidates, be they former head coaches (Jeff Van Gundy), college head honchos (Kevin Ollie) or respected assistants (Ettore Messina in San Antonio). 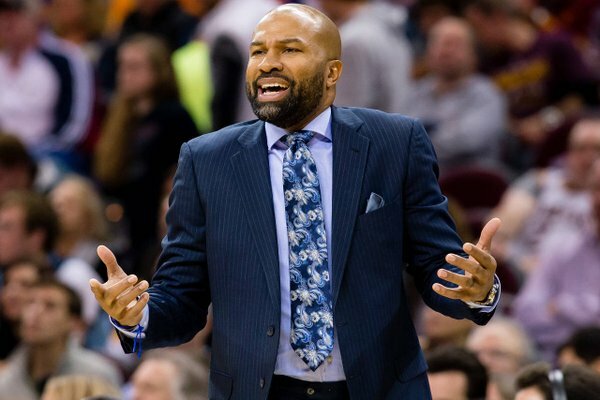 Fisher doesn’t satisfy either requirement, and the end to his time in New York is more on the dumpster-fire Knicks than himself, he hasn’t exactly proved he is worthy of another high-profile head coaching gig. If Fisher wants to return to the sidelines, he may need to do so as an assistant, this way he can gain experience and build up his current resume. His Knicks tenure could be seen as him paying his dues, because of the crap fest he endured, but it was less than a two-year stint. There will always be more established options for teams to consider, even if they’re going after would-be first-timers like Messina. That will—or at least it should—work against Fisher unless he’s willing to take the reins from a wholly lost franchise that isn’t appealing enough to land a huge name (sup, Sacramento Kings? ).